Securing your doors with digital locks and combination locks has been popular for years now, but as times are changing there are more and more solutions entering the market. But which one is right for you? 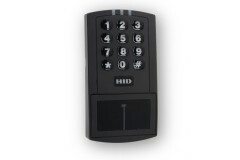 Digital keypads come in various shapes and sizes, and come as stand-alone units that work on their own - ideal for home installations - and also come as in form of part of a complete design and build solution which gives massive scope for adding staff access to multiple doors - perfect for businesses. But the principle is the same, allowing you to gain entry by entering a PIN code into the keypad to gain access, rather than having to carry keys around with you, or share keys which can be copied etc. 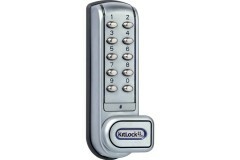 In addition to the digital range, we also have a fantastic array of mechanical combination locks, which work in the same way as the stand-alone digital keypads, except they rely on physical mechanisms rather than digital data, so do not require power / batteries to operate, and come in so many different styles, with different functionalities. Again though, the principle function is the same - you don't need keys, and you can change codes whenever you like if you feel the code has been compromised or you wish to revoke access from someone who has previously been given the code to enter. Combination code access has become one of the most popular methods of basic access control. It can be achieved on a budget, but can also be suited to high traffic commercial use on the more high end models. The choice depends entirely on what you need, and what level of use (or 'abuse') you anticipate the lock to receive. Battery Powered Digital Door Locks are ideal for variety of applications, from cabinets and lockers to high traffic doors. 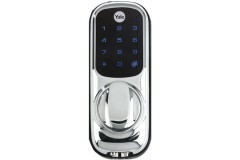 Codes on electronic locks can be changed from the keypad with the lock in sit..
Digital keypads are unlike the other digital locks, as they need to be powered by a power supply and as such, need to be cabled and fitted on the door. They do offer a number of advantages though incl..
An important part of your Access Control system, an electric or electronic lock can work as a standalone item operated by a fob or integral keypad, or it can work in conjunction with a proximity card/.. Combination door locks don't need an electronic supply, making them an ideal installation on an outside gate or in areas of a building where it would be difficult to get a power supply to a door. They.. 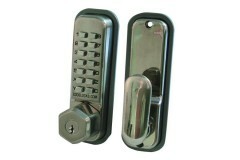 This range of combination locks are designed for use inside your premises. 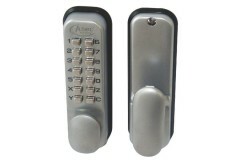 These Internal Locks with Keypads are ideal for use on office doors, indoor store room doors, IT server room doors, or anywhe.. Combination Locks for Lockers provide simple keyless access control solutions for a wide range of lockers, cabinets and cupboards. The options here can be retrofitted to an existing locker, cabinet or.. 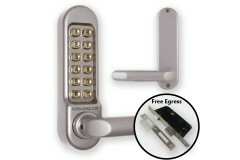 Mechanical Combination Locks to suit UPVC locks can be a little more difficult to find, but fear not! 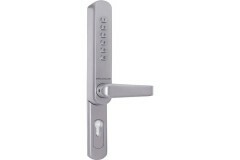 We have put together a list of products suitable for use on plastic door multipoint locks. These p.. If you are replacing an existing digital combination lock and wish to replace like for like, then the quick way to find the brand is here! We list all the big names in combination locks like KABA, Sim..